For me, one of the advantages of collecting NAO has always been its apparent insulation from the "seconds" sold in the regular Lladró line. Recently, however, two different readers of this site have submitted questions to me, with accompanying pictures, about NAO items with genuine marks in which the ship logo has certainly been scraped off (see example at right). In the regular Lladró line, an altered mark on a regular catalog piece can mean one of three things: a "second" rejected as first quality at the factory and sold at a discount, a Lladró "outlet" purchase in which first quality items have the logo scratched away to allow sale at a discount (and ostensibly to avoid competition with authorized dealer sales), or a "gray market" purchase in which non-authorized dealers acquire items outside the authorized export pipeline and alter the logos for discount sale. In all three cases, the operative phrase is "discount sale" at the retail level. 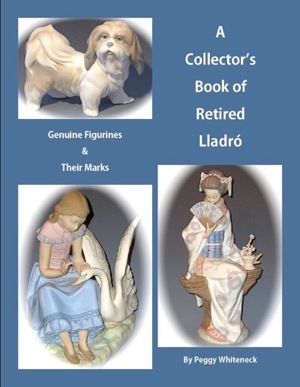 Since it is notoriously impossible to determine why a "second" gets to be that way (as any defects are not obvious) - and since, in the field of antiques and collectibles, the mark has traditionally been regarded as an integral part of a porcelain model - serious collectors avoid all Lladró products with altered marks as "seconds." That means there is a very limited market for them and the value is only a fraction of the same model with an unaltered mark. The NAO mark has had an evolutionary history that pretty much parallels that of the Lladró mark, beginning with items without marks, then progressing to an impressed mark, and ultimately to a backstamp that in turn underwent various iterations to arrive at the contemporary backstamp we have today. The marks are illustrated in the column at right. The very first NAO marks looked in outline like the first backstamp shown at right but were impressed into the porcelain and uncolored. Often, these impressed older marks did not fully imprint. On this site, you can also see examples of suspicious and counetrfeit marks. 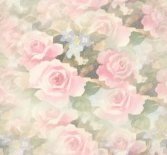 See the link at the bottom of this page or click on the "Fake NAO Marks" link in the floral banner at left. First dark brown NAO backstamp. It was preceded by an impressed mark in the very same style (used in the 1960s; the stylized, almost Grecian letters of the name didn't always impress fully in the mark and can be difficult to read). Note the absence of a logo or attribution to Lladró. This first stamp was used c 1970 to the mid 70s. 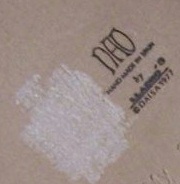 This backstamp with logo, the words "by Lladró" and the © DAISA Lladró copyright notice, with or without date, was used from about 1977 through the decade of the 80s. The increasing "clutter" in the mark made it fuzzy. This streamlined backstamp, with logo that integrates the name, was used through the decade of the 90s. In this photo, you can also just barely make out the item's serial number etched into the base, paralleling a similar (though earlier) development in the core collection. The second line reads, "Hand Made in Spain by Lladró." The Lladró company has already noted that some of its very early items were unmarked. A distinctive mark or stamp was developed almost as an afterthought, once it became clear that this company and its products were actually going to catch on. Unmarked items don't present attribution problems when the item is catalogued because it can be matched with known items to assure authenticity. The problem is that many of these unmarked items would also be uncatalogued (as we're talking the early era, when detailed production records were not kept, let alone organized) so that attribution has to be done on the basis of aesthetic and technical affinities of a given unmarked item to other known Lladró products. Even when this is done by an expert in secondary market Lladró, proof is likely to remain an abiding issue, and if you've ever seen the flat-out junk at Internet auctions being represented as "unmarked Lladró," you'll understand why the process of authentication for unmarked items has to be approached with prudent caution. That process has been further complicated by the recent discovery that Lladró made a brand called "Rosal," which was often marked only with a sticker that easily came off, leaving the item without an attribution. A similar brand called Tang, whether or not it was owned by Lladró or Lladró sculptors, called "Tang" was also marked with stickers. Some unattributed items do offer us at least a clue to origin because they are marked "Made in Spain," either impressed or in a cobalt blue stamp. Some of these are of high quality. I have seen a number of such items that I believe to be exampls of one of the Lladró brands. For more on these otherwise unattributed items marked simply "Made in Spain," see the "Made in Spain (No Brand Name)" link on the floral banner at left.